We still are very reliant on stage gate intervention points, often more due to dogma and imposed oversight by committees occasionally meeting. Decisions are determined by the human, based less on hard knowledge or dynamic intelligence, often these have tended to be thinner on the ground to validate concepts and judgement becomes highly personal and reliant on (past) experience. What can we change within this? There are leading practices to compare and contrast with but we do need to push this automating the innovation process further, in different ways. Perhaps all this can know change, with adopting a broader more connected engagement process and take this out, we can constantly engage in community collaborations to test and experiment than before. We can quickly go into the market through digital technology to engage with our communities of interest to confirm or influence a design or concept and shape it. We can gain ‘scale of insights’ quickly all the way through the new product life-cycle, validating, adjusting, adapting through to commercialization. In the past innovation took a linear route, very reliant on a manual process. I recently had some different exchanges with Jeffrey Philips, over at Ovo Innovation, a long time sparring partner on innovation thinking. 1) Defining a specific challenge or opportunity, 2) Gathering trends and developing alternative future scenarios 3) Understanding/Validating customer needs through research 4) Generating ideas/solutions through brainstorming and from these 5) Developing and Prototyping ideas. Given some more time I am sure this list would grow. Jeffrey certainly suggests many of these tasks can be accomplished through some form of automating the process, I’d agree. I’d suggest for many the innovation process in organizations are even more manually conducted in collecting data, validating actions or decisions, communicating the status, working through project tasks, etc. We are very reliant on manual systems for much within our innovation work. I don’t think we can afford to let this continue, it often slows decisions and activities significantly down. I know of consumer goods companies that work on 18 to 24 months for incremental products from conception to commercialization. Is this good enough or just comfortable enough for those involved? Bob Cooper, creator of the Stage-Gate system recently warned, in their ongoing research data “did you know that”…..1) 76% of businesses have already too many development project for the limited resources available. 2) 81% of businesses have unbalanced portfolios full of small bets, 3) 90% of businesses have “few or no” high value projects in their development pipeline and 4) 75% of businesses profess to poor project prioritization. What happens when all this digital knowledge and insights starts hitting our desks, having to work through a manual or semi-manual system seeking to capitalize on a ‘breaking’ opportunity? It will be a real choke point. Opportunity spots where we can speed up this manual process. • Many innovation teams have gathered and analysed trends by hand, attempting to forecast their impact in the future, to understand emerging needs and alternative future scenarios. • Also market research has required intensive customer interaction, which has tended to be reliant on face-to-face or observation. Equally the heavy use of surveys and large data sets has tended to have significant human involvement. This is significantly changing through the use of technology and numerous analytical tools and predictive methods. • Idea Generation has often completely relied on a number of people ‘brainstorming’ or generating ideas and we have learnt this needs to be less random in the event and more specific to problems we believe need to be solved. • Then we have been reliant on traditional prototyping methods that again reply on people to form a crude representation of a concept or idea. These were reliant on ‘hand-crafting’ prototypes, reliant on people with some skills and schedule the time to complete these but the extensive use of 3D printing is radically altering this..
We can recognize each of these have changed over the recent years. They are being automated wherever possible through pattern recognition methodologies, predictive analysis, trending evaluation methods where there is less human interaction but more interactions with a prototype, simulation. Now with the recent introduction of 3D printing the designing a prototype or even a finished product, has become highly valuable, it is shifting and beginning to disrupt many of the traditional ways of ‘machining’, undertaken in the past. For example, the dentistry business where within the dentist they can make the part using ‘on premise’ 3D fabrication. We have been seeing better structured approaches, mixed in with unstructured methods and framing techniques to pull out ideas, challenge existing, often entrenched thinking and break through roadblocks to keep moving our innovation work forward. All continue to improve but still miss opportunities to automate in some way or another. As we have used software to collect information and ideas at the front end (idea management systems) this have made the innovation process far more automated, interesting and participative. 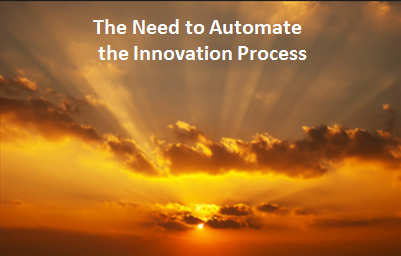 What is needed is to push the thinking on how to automate the innovation process even more. We see start-ups adopting agile methods, lean processes and new practices, new visualization tools and frameworks, designing techniques as they are unencumbered by a legacy, yet for the most part, large organizations have been slow to adopt these on a wider corporate practice. They still experiment but do not adopt these as organizational practice although this is changing constantly as they value these techniques. These need pushing deeper into large business organizations. We need a functional group that explores, experiments and seeks broad adoption of many different tools and pioneering methods in our organizations, so they become increasingly part of the daily tool-kits we use. Design thinking, business model design,and lean for example, all should be adopted as everyday tools. Each helps innovation. Can this be pushed further; can we perhaps become more radical? Digital technology might be giving us the tools to shape our environments in very powerful and different ways. We can amplify what is going on, we can capture all the interactions, we can discover, explore and extrapolate better and at growing scale. Less randomness, more of a quest for rational answers but we still need to frame the questions we want answered and that still seems to remain difficult for us humans to do. Even here technology can give us increasing intelligence to spot patterns. There is so much to be realized, connected and enabled for the higher scale, richer, more innovative business outcomes but it is a massive undertaking that is only just being ‘kicked off’ by the current ‘internet of things’. It will eventually become the ‘integration of everything’ but the disruption and realization of what needs changing is only just dawning on many. External insights coming from market and customer intelligence will not fully take hold as Enterprise knowledge throughout the organization, without real, deep integration of systems designed to ‘receive, translate and diffuse’ valuable knowledge from all this digital information flowing in. A new system of knowledge adoption needs designing in. Receiving the knowledge alone will not turn these into higher scales, richer, more innovation business outcomes that have real growth value, unless we realize the massive ‘mismatch’ between digital flowing in and the physical attempting to cope with this. We need to think our innovation system designs a whole lot deeper to allow these new digital technologies and the insights to be worked through the innovation process. Speed is becoming ever more important, for new solutions to be turned out the other end as new innovation. We need to design a complete innovation system otherwise we will be investing in a front loaded area alone, limiting digital impact and that will not deliver the power of actual growth expected or needed from our innovation activities so as to deliver new valuable outcomes. Approaching the innovation process holistically helps. This entry was posted in Sequencing and tagged 21st century innovation, Age of digital innovation, Business models and digital transformation, Changing landscape for innovation, Digital discovery, Digital leadership, digital technologies and innovation, driving transformation, Embedded technology, physical and digital, relentless innovation and change needed, smart technology, testing business models. Bookmark the permalink.